1 – Number of top fives Joey Logano has posted at Homestead-Miami Speedway (fourth place, 2015). 2 – Number of times Joey Logano has made it to the Championship 4 in the new Chase format (ties with Kevin Harvick, Kyle Busch for the most among the Championship 4) – Logano finished fourth in the 2014 Chase standings after finishing 16th in the race. 3 – Number of wins Joey Logano has posted during the 2016 season; including two during the Chase for the NASCAR Sprint Cup (Michigan International Speedway, Talladega Superspeedway, Phoenix International Raceway). 4 – Joey Logano’s career-best finishing position at Homestead-Miami Speedway (2015). 5 – Number of top-five finishes Joey Logano has posted during the 2016 Chase for the NASCAR Sprint Cup. 7 – Number of top-10 finishes Joey Logano has posted during the 2016 Chase for the NASCAR Sprint Cup. 10.7 – Logano’s average finish during the 2016 season. 15 – Number of top-five finishes Joey Logano has posted this season. 25 – Number of top-10 finishes Joey Logano has posted this season. 72 – Total number of laps led at Homestead-Miami Speedway by Joey Logano. 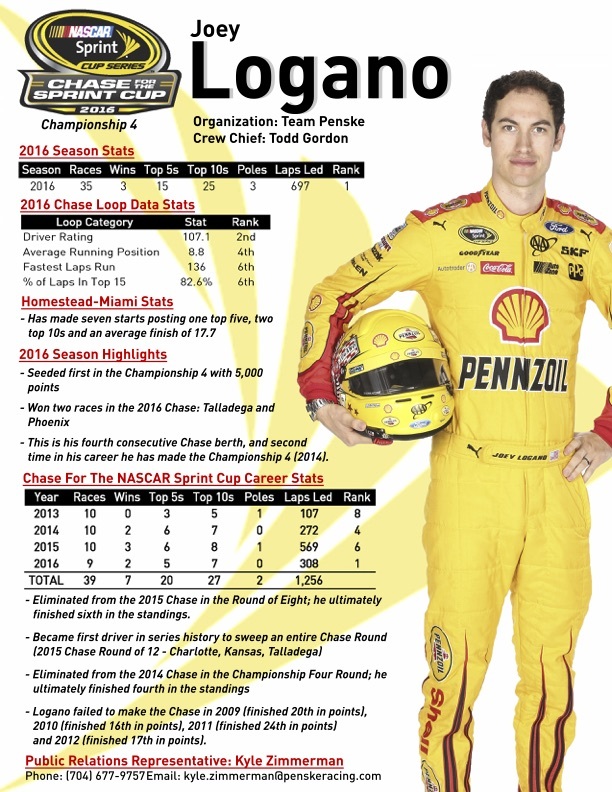 83.5 – Joey Logano’s career driver rating at Homestead-Miami Speedway (fourth-best among the Championship 4). 107.1 – Joey Logano’s driver rating during the first nine races of the 2016 Chase. In sports, greats elevate their game under intense playoff pressure. It’s hard to wear the crown if you wilt under the intense spotlight. So, Joey Logano’s race in Phoenix should be considered one of the all-time great performances (and, yes, that might be a bit of a stretch … but hear us out). It all started well before driving his No. 22 into Phoenix’s Victory Lane on Sunday. It started after Texas, when one look at the standings and subsequent clinch scenarios showed that only a victory guaranteed entry into the Championship 4. Logano, officially, sat inside the cut-off line, but by only one point. The pressure was immediately on. In continued in the closing laps, prior to the last caution that flew because Matt Kenseth’s car – and championship hopes – smashed into the wall. Prior to that caution, Logano fought off Kevin Harvick, the king of Phoenix, lap after lap. That position was vital to Logano’s championship hopes. As they ran, had Harvick passed Logano, the driver of the No. 22 would not have made the Championship 4. And finally, Logano shrugged off pressure a third time on the final restart at lap 323 at Phoenix, holding the lead and locking in the third spot in the Championship 4. Above anyone, Joey Logano has experienced the highest of highs and lowest of lows of this Chase format, which is now in Year 3. In 2014, Logano made the Championship 4, only to have his title hopes dashed by a lengthy pit stop that helped lead to a 16th-place finish. Last season, he swept the Round of 12, but the Martinsville wreck with Matt Kenseth proved the end of his title aspirations. Logano had a series-leading six wins last season. Now, he’s back for redemption. His Homestead numbers are solid, but not otherworldly. In seven starts, he has one top five (a fourth, last year) and two top 10s. He led 72 laps in last year’s season finale at Homestead. At 26 years old (on Sunday, he’ll be 26 years, 5 months and 27 days, to be exact), Joey Logano wouldn’t rank as the youngest champion in series history, but he’d be the youngest in quite a while. If Logano wins the championship, he’d be the youngest since Kurt Busch in 2004 (26 years, 3 months and 17 days). He also would join Team Penske teammate Brad Keselowski and Kurt Busch as just the third under-30 champion since the turn of the century. Team Penske owner Roger Penske began 2016 with a grand celebration honoring his 50th anniversary in racing. Now, he looks to end it with a NASCAR Sprint Cup Series championship. It would be the culmination of an outstanding year for one of NASCAR’s legendary owners. His drivers Brad Keselowski (four wins) and Joey Logano (three wins) combined for seven wins and two berths in the Chase for NASCAR Sprint Cup. Keselowski was eliminated from the Chase following the Round of 12. On the IndyCar side, Penske captured the championship with Simon Pagenaud, who – coincidentally – also drives the No. 22. If Logano can capture the title on Sunday, it would be Penske’s second NASCAR Sprint Cup Series championship. The first came in 2012 with Brad Keselowski and the No. 2. Driver-crew chief chemistry is a key ingredient to a championship season. And few have a better relationship than the steady Todd Gordon and the ultra-talented Joey Logano. Though 21 years separate the two, the Gordon-Logano pairing have been a dream combo. The success is evident by taking one look at the stat sheet: 15 wins, 97 top 10s and four top 10 championship finishes. More proof of Gordon’s success as a leader: Just three months after the heart-wrenching loss in the 2014 Championship Race due in part to a slow pit stop, the 22 team rebounded for their first Daytona 500 victory.